Apple’s AirPods seems to have launched us into the era of fully wireless headphones becoming more accepted by the mass market. So it was inevitable Monster was going to give fully wireless headphones a go and the result is something a lot more sparkly than you may have expected. Chief Noel Lee was his usual larger-than-life self during Monster's CES 2017 keynote and showcased the company's new AirLink technology. 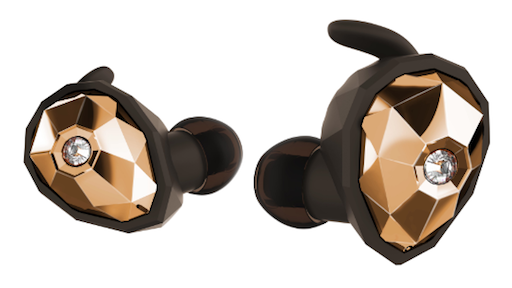 AirLink will be included in two ranges of their upcoming headphones, the Element and iSport range. With AirLink, monster is proclaiming they’re able to achieve a zero-latency connection that is extremely reliable thanks to the Y-shaped antenna housed within the headphones. Just like the Apple AirPods, the battery life of these headphones isn't going to be great on their own, the Elements come in at 2.5 hours — but just like their closest competitor, they also come with a case that’s able to charge the buds. Monster claims that mobile listening time on the Elements are 21 hours, after which, you better make sure you have its case charged again. Monster is no stranger to controversial headphone designs and the Elements feel like an iteration of the company’s Diamond Tears Edge headphones from 2013. The Elements were designed with jewellery in mind, except they look incredibly tacky right down to the fake diamond in the middle of the earpiece. Monster introduced these headphones as more of fashion accessory than an awesome sounding pair of headphones, let’s hope even if the design doesn't appeal to everyone the sound quality will. What’s more aesthetically pleasing is the Monster iSport headphones that come with the same AirLink technology but deliver it in a body you wouldn't think twice about putting in your ear. These are created with the more active consumer in mind and will presumably have exclusive features suited to their purpose such as being sweat-proof. One of the main selling points of the Apple AirPods is the W1 chip that allows the headphones to connect instantly to your iPhone — it is currently unknown whether Monster AirLink headphones will feature any functionality similar to this when they launch. The Elements are being released first in April for $300 (£245) while the iSport models don't currently have a price or release date.